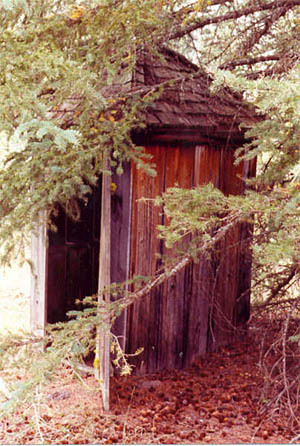 Photo of shingled outhouse by P.W. Parts of the 'good old days' weren't all that good. Outhouses, for example. Dr. Spock would have revised his theories about toilet training if he or his children had had to use outdoor biffies. Teaching a toddler to respond to a natural urge is simple compared to convincing that child to venture outside to a separate building with a gaping hole where strange things might lurk. Child, heck, many adults felt the same way. Location, excavation, maintenance and hygiene were concerns. But, just getting there could be a problem. First one had to make a decision. When the final trip of the evening isn't a few steps across the hall, but a foray into the outdoors, which, in winter, requires bundling in warm clothing, putting on boots, and carrying a reliable light, it's not undertaken casually. Is it necessary? Will it really be the last time till morning? If it had to be done, best to get it over with. Otherwise the potential sleeper might dither till daylight. Just getting to and from the facilities was fraught with peril. There are stories, some of them true, about people going to the barn or outhouse and not making it back through the whiteout of a Prairie blizzard. Prairie people learned. In winter they strung ropes from one building to another so the lost person could hold on to the rope and struggle back to the warm house. Even in daylight there can be problems. As a newly wed I lived in a house in the middle of a cattle ranch. In winter forty cows usually stood between me and the outhouse. "Move!" I ordered, timidly. "Moo! She speaks our language! Say, lady, got any hay?" was the bovine response. You don't have to be in cattle country to find obstacles as I discovered the night a herd of elk bedded down around our tent in Glacier Park. My personal wishes paled before the picture of annoyed awakened elk. "It'll be morning soon." Getting in, of course, doesn't mean it'll be easy to get out again. One of our friends was just opening the door, ready to return for dinner, when a chorus arose. "Alice, don't come out! There's a bear on the path!" At times like these a person really appreciates the thought behind furnishing the little house with an Eaton's catalogue and maybe a few farm papers. Handy reading material for a longer than usual stay. Since there was usually only one outhouse, competition could be fierce. I was surprised to meet a hiking friend limping and leaning on a cane. "Mountaineering accident. ", he explained tersely. This man had climbed safely in Nepal. I waited for details. "I was climbing from the Kain hut in the Bugaboos", he muttered. "Broke my ankle in the early morning rush for the outhouse." One of the things children fear about the outhouse is that there are wild creatures in there. How right they are. Squirrels, porcupines, even pine marten have taken up residence, deciding that the quarters, though odorous, provide a refuge from predators. None of these animals is a safe companion for private moments. Pine marten, though small and cuddly looking have sharp teeth and claws and can leap through the air in warp speed as some surprised folk can testify. 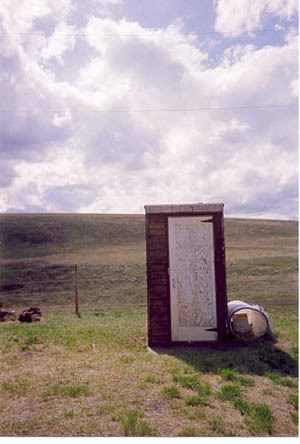 Even if no natural perils were present, the outhouse served as an open invitation to mischief. Ask any girl who braved the school biffy in snowball season. Running the gauntlet indeed. On Hallowe'en grim householders stood guard over their structures, determined to defend them against sneak attacks by local teenagers. Some of those respectable fellows remembered their own youth pushing over outhouses, once, it was whispered, with the owner inside. From a kid's point of view an outdoor biffy wasn't all bad. It served as a convenient excuse for dodging chores. It's not as simple to roust the kid whose turn it is to pack water from a wooden structure way across the yard as it is to hammer on a bathroom door. Outhouses were built in a variety of styles, reflecting the personalities of their owners. The practical sort put up a rough building, tossed in some sandpaper and called it done. Others decided to make the best of it. 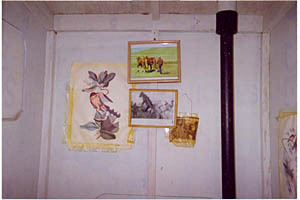 Theirs were designer facilities with mirrors, pictures, curtains on the window, bookshelves even hanging flower baskets. facilities might consist of a seat and three poles to lean on; a little public, but it encouraged communication. No matter how posh the surroundings, they couldn't overcome the eerie evening excursion. The influence of the rugged Canadian landscape on our national character and artistic expression has been well documented. Not enough attention has been paid to the outhouse and its effect on the Canadian imagination. Hardened skeptics by day became firm believers in the supernatural on those dark lonely journeys to the isolated building. Past the hen house with its strange cackles and squawks, through the trees where the breeze, they hoped it was the breeze, whooshed the branches, stealthy footsteps, (cougar, bear, sasquatch?) crackled dead twigs. Were they being followed or observed from behind some ancient stump? Yes, the ghostly world was very real on an ll:00 p.m. trip to the little house. What'll become of Canadian character with only portable plastic clones? We'll just have to risk it. My son's memory of a time when life was less comfortable is practical. "Coloured paper, " he recalls, " was better than the black and white."